Former world champion Mark Foster says Ben Proud can make a big impact for Britain at the 2016 Olympics. The double Commonwealth Games gold medallist broke a second British short-course record in as many days when he won the 100m freestyle in 46.69 secs at the ASA winter meet in Sheffield. Proud had bettered Foster's 14-year-old 50m freestyle mark on Thursday. "This is Ben's moment and he is going to be one of our stars come the Olympics next year," Foster said. 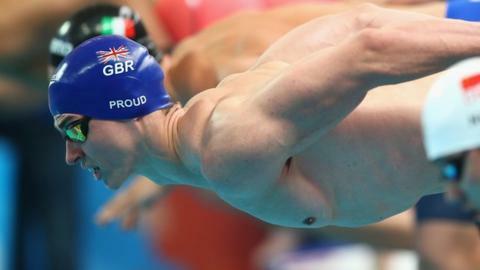 Plymouth Leander swimmer Proud's time beat the previous national 100m freestyle mark of 46.75 set by Adam Brown in 2009. "I was number one in the UK from 1985-2008, and it's nice now someone can take on the mantle and progress it and take it a step further otherwise Britain just gets left behind by the rest of the world," Foster told BBC Radio Devon. "These are stepping stones towards the Olympic Games and to lay these times down now - I think the 50 free was second-fastest in the world this year - he's in good form. "At the Olympic Games he'll have to be at the top of his game and do best times to stand a chance of winning a medal."